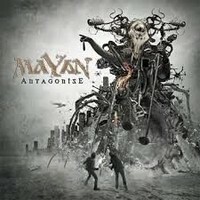 And from Holland, comes again the septet MAYAN, with their second coming, “Antagonise”. The same Symphonic Death Metal we hear on their first work, “Quarterpast: Symphonic Death Metal Opera” is present again, with improvements of arrangements, and the adding of a soprano vocalist (Laura Macrì) and a clean male vocal (Henning Basse), as one of the guitarist left. But the essence of their music is the very same: a fusion of Melodic Death Metal aspects with Power Metal orchestrations, but in a perfect form, now more coherent and solid. Now having Joost Van Den Broek in the production (who worked with AFTER FOREVER, DELPHIAN, and others), the sound itself gained a lot of weight in terms of their debut, but the sound is pretty heavy and aggressive on this album, even sounding clean. And it’s a good album, having as special guests Floor Jansen (in some vocals), Marcela Bovio in vocals and choirs, and Dimitris Katsoulis on the violin. The album as a whole is good, and will bring them to a new level, having the better songs in “Bloodline Forfeit” (a perfect marriage between aggressiveness and orchestrations), the more harsh “Redemption - The Democracy Illusion” (wow, these guitar riffs and keyboards are wonderful), the well-worked “Paladins of Deceit – National Security Extremism part 1” (this drummer is a monster. His technique along with capacity for guiding the rhythm along with bass guitar is incredible), “Devil in Disguise” (if wouldn’t for some harsh voices and some arrangements, would be a Power Metal song, indeed), the extreme “Human Sacrifice” (now, if weren’t by some more melodic, soft and well-worked moments, would be a Death Metal song), the wonderful “Capital Punishment”, and “Faceless Spies – National Security Extremism part 2”. Great album, no doubt about that.